Tacoma, Washington: Elliott Press, 2013. Edition of 33. 6.25 x 4.25 x .75"; 100 cards. Laid in illustrated paper divider. In clear acetate box case. Includes 4-page 4 x 6" enclosure with colophon and other information. Numbered. Colophon: "A Strange Case of Alchemical Munificence was concocted in January, 2013, at Pacific Lutheran University's Elliott Press in Tacoma, Washington. The cards are handset and letterpress printed, incorporating pochoir, linoleum carving, and type (a mixture of lead, tin, and antimony). 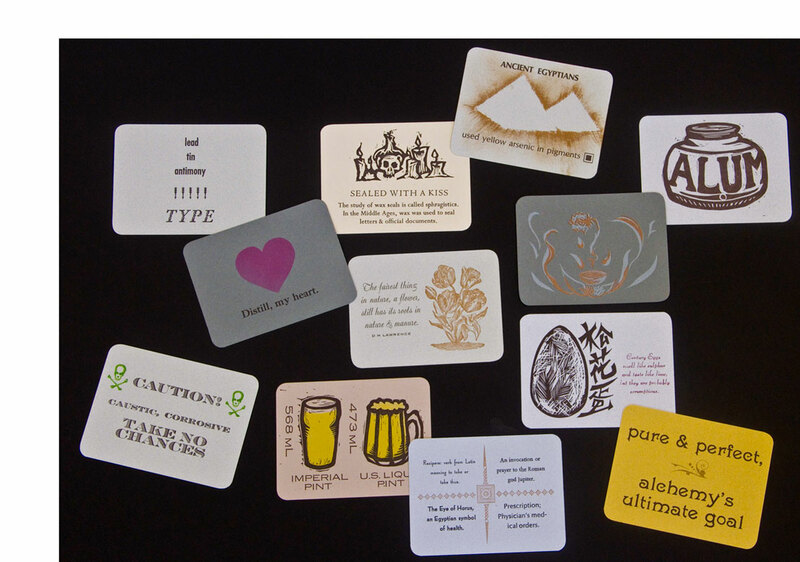 Multifarious papers from a secret printer's closet feature 17th century alchemical symbols transformed with content by students in Jessica Spring's Art of the Book class." Introduction: "A Strange Case of Alchemical Munificence contains symbols that illustrate peculiar items and ingredients specific to the lost art of transformation better known as alchemy. Although the processes of alchemy seem occult, many of the methods and findings made by practitioners of the art heavily influenced modern science. While some of their traditions carry on today, a large portion of alchemical history is still shrouded in mystery due to the fact that alchemists encoded their recipes in a secret language of symbols. We have divided these symbols into the nine categories that constitute this deck: Tools, Elements & Seasons, Metals, Minerals, Noxious Substances, Measurement, Processes, Dr. Shaw's Pantry, and Gold. 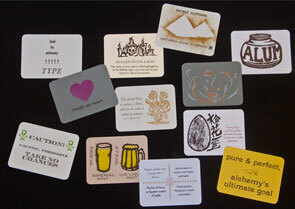 We encourage readers to mix and match cards from each category, creating their own alchemy while enjoying ours."